Lockers have proved the importance of their presence at various places, say from schools, offices to industrial spaces. It is well-known that they fulfil the basic requirement of storing personal belongings such as garments, bags, books, wallets or mobile phones, at any workplace, but if you are an employer at an industrial workplace, lockers are an essential requirement for your employees. Overlooking this increasing need of lockers over a period of time, it can be stated that it has become an employer’s responsibility to provide personal locker to every employee so that they can easily store their belongings in it. A valid question may arise for every employer who is looking for a solution to the storage space problem that their employees are facing in the industrial space, that is, what are the best options available in the market for cheap metal lockers to satisfy the needs? When it comes to dealing with varied needs and wants of your employees, it may lead you to go through a long search procedure either on online resources or through local shops pamphlets, but what if, you can get solutions for each and every complication in one place, won’t it reduce your task? Read more to find out. It can be difficult to keep the clean garments and the dirty ones separate when your employees are working with huge machines and in dirtier surroundings. To tackle this situation, two great options are available to you to choose from. First, the Clean & Dirty Locker and second the Uniform Locker. The Clean & Dirty Locker comes with a full-width top shelf and a central divider to provide separate spaces to keep the dirty garments and the clean ones. For much convenience to hang the garments, double coat hooks are provided for each compartment. 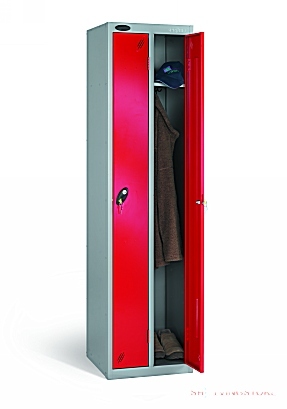 Whereas the Uniform locker has some identical features as the Clean & Dirty Locker, the only additional feature that is provided is that one compartment has fixed shelves for giving much convenience for storing objects. Managing the room available smartly is what you require when your industry is dealing with hundreds and thousands of employees. Providing a personal space to each individual becomes difficult, but not when you have some exceptional options available on your screen. The Twin Locker and Two Person locker, give you the ease to satisfy your employees. Twin Lockers are designed especially for those situations when there is not enough area available to install huge cabinets. As the name suggests it has two compartments in one locker. Each compartment consists of a top shelf for every person. The slim hanging space is provided with double coat hooks for each person. Talking about Two Person locker, it provides two vertical compartment sections for each person using it. Locks for both the doors come with a common key. Like the others, the hanging space comes with double coat hooks. Furthermore, each person gets a full-width top compartment to store some extra articles such as first aid kit, helmet and so on. When the area is congested, opting for lockers that are super slim is advisable. To tackle this complication, Ultra Slim Lockers are designed. These are an ideal solution so far. For convenience, these metal organizers come with two and four door options. The compartments have elevated height spared with double coat hooks. Also, each person using it gets a top shelf as an extra storage option. Thus, we can claim that this ultra slim fix is truly a space saver. The High Capacity Lockers are a premium solution if you wish to compliment your employees with some additional space. These come with three full-width compartments. For much comfortable usage more features are available such as an adjustable hanging shelf and a separate shelf that can also be adjusted as per its utility. Using specially designed metal lockers at any place such as factories or at a garage can help you get over the significant problem of storage for your employees. As metal is a material known for its characteristics of being malleable or ductile. Using these strong box made of metal can turn out to provide you better space, freeing up the room for congestion. It is definitely secure and durable which would certainly reduce the continuous investment in lockers, either if you are planning to buy new ones or to maintain the old. Moreover, everything stays organized in them and the room appears to be much cleaner and well-maintained. For the varied needs and wants of your employees, we have the best solution then why wait? Grab your devices to order. This entry was posted on Monday, August 27th, 2018 at 11:58 am	and is filed under lockers. You can follow any comments to this entry through the RSS 2.0 feed. Responses are currently closed, but you can trackback from your own site.